Featuring over 100 recipes, The Gourmet Cookbook celebrates five years of food, and recipes, garnered from the pages of Condé Nast House & Garden Gourmet magazine. From aspirational yet easy-to-follow dishes by some of South Africa’s top chefs (David Higgs, Peter Tempelhoff, Chris Erasmus) and food icons (Susan Greig, Andrea Burgener, Judy Badenhorst) to the coveted recipes of home cooks as well as the editor’s own specialties, these pages focus on a range of accessible and delicious everyday dishes. The Gourmet Cookbook is divided into five chapters – Aperitifs & Appetizers, Starters, Mains, Sides & Salads and Dessert. And there are accompanying menu suggestions to tailor-make a stylish dinner party, an al fresco lunch, a festive feast or a laid-back family meal. 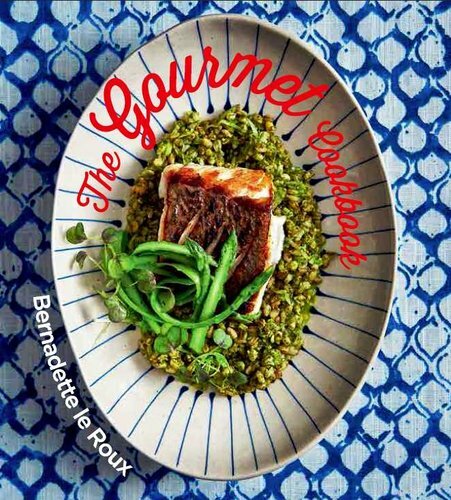 Bernadette le Roux is also the author of a number of cookbooks, including the acclaimed Prickly Pears and Pomegranates — co-authored with her mother Marianne Palmer — which won a World Gourmand Award in Paris for Best Local Cookbook (2009). Best known for her uncomplicated 'real' recipes as presented in her second book, Roots, Shoots & Leaves, as well as her engaging voice as author of South African chef Reuben Riffel's Reuben Cooks Local, Bernadette has become known to a wider audience through her editorship of Condé Nast magazine House & Garden: Gourmet. She is also part owner of the family-run Café Roux restaurants in Noordhoek and Cape Town's Shortmarket Street. I’ve been reading House & Garden Gourmet since its early issues years back and I have to say, for anyone with a passion for cooking, you can’t go wrong with this collection of recipes. The book covers everything from fresh salads and easy sea food to more challenging options (I haven’t had the courage to try the beef wellington) and it’s as much a feast for the eyes as it is for the taste buds. Highly recommend this one.